Boston often sits under rather large swirls of clouds. Hurricane Joaquin was a surprisingly narrow miss last week. Experts may worry even more about northeasters like those that pounded Boston last winter. In a truly major storm, hundreds of thousands of people may wait too late to evacuate and be stuck without power or other services for weeks. In the long run, Boston’s inner harbor will need to look a lot more like the future New Orleans, with the waterfront turned into parks and wetlands, and Logan Airport and residential areas barricaded behind high levies. That’s some of what we heard on Wednesday about how Boston is readying (or not) for climate change. Here are 10 highlights from a Hubweek session’s speakers and videos, held at Harvard’s Sanders Theatre. 1. Sitting in between the Canadian Arctic and the Gulf Stream, the northeastern U.S. has “one of the most significant temperature gradients on the planet,” commented Kerry Emanuel, MIT professor of atmospheric sciences. 2. 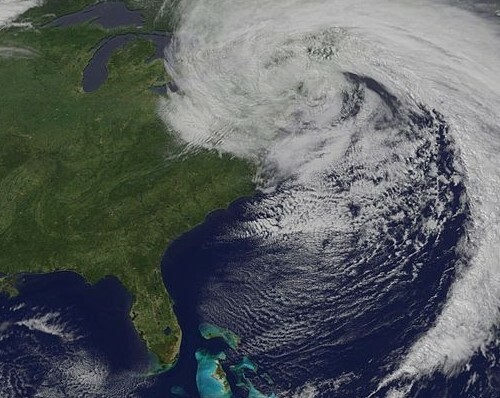 Joaquin was “the most intense extratropical storm ever to reach this high in latitude this late in the season,” said James McCarthy, Harvard professor of biological oceanography. “That was really eye-opening.” The storm packed winds up to 155 mph as it veered off toward Bermuda. 5. People in Boston “think they are tough and want to sit home and wait it out,” said Jennifer Leaning, professor of the practice of health and human rights at the Harvard Chan School of Public Health. But by the time residents realize they really need to leave, it may be too late, and they may lose power for weeks. Atyia Martin, Boston’s chief resilience officer, pointed out that emergencies like Katrina have shown that many people don’t get clear word in time, or simply can’t leave. “We assume people are not educated about these issues, but they are,” Martin said. In planning for emergencies, it’s key to remember that “the community is the expert on the community,” she emphasized. 6. Last week’s astonishing South Carolina rainstorm often was called a thousand-year storm. That description is meaningless, because “there’s no precedent for a storm like this,” Schrag said flatly. 7. Unsurprisingly, much of the South Carolina flooding was in areas of recent development, “in places where water would like to be,” as Young put it. That’s a theme all along the coast: Some new Gulf coast communities just should never have been built, he remarked. 9. “Money seems to flow after a disaster,” Schrag noted, but not always in the best directions. We’ve done a “terrible job” recovering from Hurricane Sandy, in Young’s opinion. To actually create change, he declared, governments and all their partners must move very quickly after storms before business as usual resumes. Owners in floodplains, for instance, may be ready to buy out a few weeks after the storm, but not a few years after. Boston under a hypothetical-but-expected flood (from Boston Harbor Associates data). This entry was tagged climate change, ocean, oceanography. Bookmark the permalink.